The story and history of Saint John Chrysostom. John was born at Antioch in 344. In order to break with a world which admired and courted him, he in 374 retired for six years to a neighbouring mountain. Having thus acquired the art of Christian silence, he returned to Antioch, and there labored as priest, until he was ordained Bishop of Constantinople in 398. The effect of his sermons was everywhere marvellous. He was very urgent that his people should frequent the holy sacrifice, and in order to remove all excuse he abbreviated the long Liturgy until then in use. 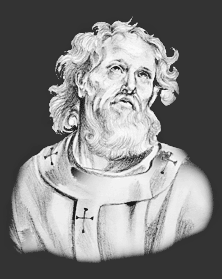 St. Nilus relates that St. John Chrysostom was wont to see, when the priest began the holy sacrifice, "many of the blessed ones coming down from heaven in shining garments, and with bare feet, eyes intent, and bowed heads, in utter stillness and silence, assisting at the consummation of the tremendous mystery." Beloved as he was in Constantinople, his denunciations of vice made him numerous enemies. In 403 these procured his banishment; and although he was almost immediately recalled, it was not more than a reprieve. In 404 he was banished to Cucusus in the deserts of Taurus. In 407 he was wearing out, but his enemies were impatient. They hurried him off to Pytius on the Euxine, a rough journey of nigh 400 miles. He was assiduously exposed to every hardship, cold, wet, and semi-starvation, but nothing could overcome his cheerfulness and his consideration for others. On the journey his sickness increased, and he was warned that his end was nigh. Thereupon, exchanging his travel-stained clothes for white garments, he received Viaticum, and with his customary words, "Glory be to God for all things. Amen," died. The Feast Day of Saint John Chrysostom is January 27. The origin of Feast Days: most saints have specially designated feast days and are associated with a specific day of the year and these are referred to as the saint's feast day. The feast days first arose from the very early Christian custom of the annual commemoration of martyrs on the dates of their deaths at the same time celebrating their birth into heaven.